An extremely rare but regular breeding species and migrant. The Piping Plover was a very rare species during the Minnesota Breeding Bird Atlas (MNBBA). The Piping Plover’s breeding range includes disjunct populations located in three discrete locations: (1) the north Atlantic coast; (2) the Great Lakes; and (3) the northern Great Plains, from southern regions of the Canadian Prairie provinces south through the Great Plains. In 2011, approximately 59% of the breeding population occurred along the north Atlantic Coast, 39% in the northern Great Plains, and 2% in the Great Lakes (Elliot-Smith et al. 2015). The Piping Plover has been assigned a Continental Concern Score of 18/20 by Partners in Flight, the highest score for any Minnesota breeding species, and is designated a Highly Imperiled species by the U.S. Shorebird Conservation Plan Partnership. The Great Lakes population (which includes the Duluth-Superior Harbor population) is federally Endangered, the northern Great Plains population (which includes Lake of the Woods) is federally Threatened, and the Atlantic coast population is federally Threatened. In Minnesota the Piping Plover is officially classified as Endangered and is a Species in Greatest Conservation Need. A short-distance migrant that winters along the south Atlantic and Gulf coasts. Terrestrial and aquatic invertebrates secured by pecking and probing marine and freshwater shorelines as well as by gleaning prey from beach vegetation. A shallow scrape usually lined with small pebbles and shell fragments. Over the years, Minnesota has had the unique distinction of supporting birds from both the Great Lakes and the northern Great Plains populations, the former nesting in the Duluth-Superior Harbor, and the latter on Lake of the Woods. One hundred years ago, Roberts (1932) wrote that this diminutive and endearing little shorebird was known only as “an infrequent migrant” in Minnesota with several May reports along the Mississippi River in southeastern Minnesota and a few scattered May reports from Waseca, Lake, and Lincoln Counties. One has to wonder whether his report of an adult collected in Duluth in early July 1923 for the American Museum of Natural History was a lingering migrant or actually a member of a very small breeding population discovered in the harbor 16 years later. When Roberts himself saw 4 adults on July 15, 1915, “on the tip of the long sandy point at the entrance of the Rainy River into Lake of the Woods,” he was less than 3 miles from Pine and Curry Island. This site would later be documented as the primary Piping Plover breeding site in Minnesota, supporting as many as 20 to 30 nesting pairs during its peak in the 1970s and 1980s. Just a stone’s throw from Pine and Curry Island is an even larger and longer island in Ontario, Sable Island, which also has a history of supporting a small Piping Plover breeding population (Cadman et al. 2007). Although breeding records had yet to be documented when Roberts published his treatise on Minnesota birds in 1932, he noted that Minnesota was “well within the assigned breeding-range of the Piping Plover.” Indeed, that very same year a young graduate student, Gus Swanson, documented a nesting colony on what was then known as Curry Island in Lake of the Woods (Risser 1932). Four years later, Olga Lakela (1940) found the first nesting pair on Minnesota Point in Duluth. In the 1930s, breeding records were also documented in Otter Tail County (1933), Douglas County (1936, 1937), and Mille Lacs County (1938), all notably during the drought years, when more beach areas were likely exposed (Green and Janssen 1975). Three young were also observed in 1941 in Roseau County, presumably along the shoreline of Lake of the Woods (Reif 1941). The only other confirmed nesting attempt is a report of 2 nests and 2 broods at Agassiz National Wildlife Refuge in Marshall County in 1980 (Janssen 1987). Apart from these records, the bird has never been confirmed nesting anywhere other than in the Duluth-Superior Harbor and on Lake of the Woods (Green and Janssen 1975). A brief history of these two breeding populations follows. Duluth-Superior Harbor: Following Lakela’s initial report in 1936, Piping Plovers continued to nest on Minnesota Point through 1941. Only a handful of nesting pairs (2–8) found suitable habitat on the tip of the point in a location that had recently been augmented with fresh dredge spoils (Minnesota Ornithologists’ Union 2016; Lakela 1940). Five seasons after Lakela’s initial discovery, she lamented the fact that encroaching vegetation and the recreational popularity of Minnesota Point might eventually make the site unsuitable. Her misgivings would prove true as the birds began a succession of moves to other dredge-spoil sites, which Common Terns, their frequent co-nester, also found attractive, including Hearding Island, Barker’s Island (Wisconsin), and the Port Terminal (Niemi and Davis 1979). Nevertheless, despite high levels of disturbance, several pairs occasionally continued to nest on Minnesota Point, as well as on nearby Wisconsin Point. From 1940 to the late 1970s, the most thorough documentation of the plover’s nesting history in the harbor was a series of reports by Lakela (Lakela 1946; Longley and Harrell 1946) and the Duluth Bird Club (e.g., Bronoel 1948, 1953, 1954, 1955; Hofslund 1950, 1952) on the nesting birds of Hearding Island, formerly known as Harbor Island. The club documented plovers nesting on the site 8 of the 11 years from 1945 through 1955. Most years only 1 to 3 nests were found, but in 1948 they reported a record 10 nesting pairs. Documentation of the plover’s nesting attempts in the harbor from the late 1950s through the 1960s is scanty, and most reports note only that the birds nested “as usual” in Duluth. By the early 1970s, the last site where they consistently were observed was the Port Terminal, another dredge-spoil site that was heavily disturbed by vehicle and people traffic. One to 8 pairs attempted nesting at the terminal through 1985, the last year that nesting Piping Plovers were observed in the harbor. Several efforts were made to provide more secure breeding habitat elsewhere in the harbor for both Common Terns and Piping Plovers, but these attempts succeeded only in relocating the terns to one site, Interstate Island (Schimpf and Pfannmuller 1984). Today, plovers are occasionally seen migrating through Duluth during the spring months, but sightings during the summer breeding season have been extremely rare. The St. Louis River Alliance in Duluth has an active program trying to restore the Piping Plover to the Duluth-Superior area. Lake of the Woods: When Swanson visited Pine and Curry Island in 1932, he did not estimate the size of the Piping Plover colony but noted that he saw many young birds as well as 1 nest with 2 eggs (Risser 1932). The site was visited on five more occasions between 1934 and 1940 by an assortment of curious birders; the largest number of nests was reported when Swanson revisited the island in 1938, documenting a total of 15 nests (Erickson and Upson 1938). Thirty-seven years passed until the next report of the plover’s activities on Pine and Curry Island, when in the summer of 1977, 3 birds were observed (Eckert 1978). Most interesting was a report two years later, when an estimated 20 to 30 pairs were observed (Anderson 1979). Then, in 1981, not only were birds continuing to nest at Pine and Curry Island (16 pairs plus 5 individuals; active nests were only located for 8 of the 16 pairs), but 2 pairs (1 nest with 4 eggs and 1 pair with 3 chicks) and 9 individuals were found at one other site on the lake’s southern shoreline (Rocky Point), and 1 pair (a territorial pair with a broken egg) was found many miles farther north on a small islet just off the shore of the Northwest Angle (Hirsch 1981). These observations coupled with knowledge of the species’ rarity and decline throughout North America launched a long-term initiative to study and monitor the Piping Plover population on Lake of the Woods. Unfortunately, the late 1970s and early 1980s appeared to be the birds’ heyday on the lake, when there were between 44 and 50 adult plovers in 1982, 1984, and 1985 (Wiens and Cuthbert 1984; Wiens 1986). Today, the habitat available on Pine and Curry Island has diminished significantly. The island was nearly 4 miles long in the 1980s, and now only 2.5 miles remain (Herwig 2014). The loss is largely a consequence of high water levels that erode the low-lying sandy beaches, and the lack of sediments to subsequently replenish them. Since 2010, only 1 nest has been reported in 4 of the 7 years through the 2016 breeding season (Herwig, pers. com.). On rare occasions, birds are observed on islands farther north by the Northwest Angle (e.g., Garden Island, 2006; Kessen and Svingen 2007). During the MNBBA, Piping Plovers were observed in only 2 of the 6,987 atlas blocks visited: 1 nest with 3 eggs was found in 2013 on Pine and Curry Island, and farther west, 1 pair was observed at Rocky Point (Figure 1; Table 1). Clearly, the contribution of Minnesota to the plover’s national status has diminished significantly. Indeed, the Piping Plover’s status as a regular breeding species in the state is in jeopardy. Elsewhere within its breeding range, the Piping Plover experienced similar declines in abundance and distribution. This was especially true in the Great Lakes region, where nesting plovers disappeared from all but Michigan by the time of listing as federally endangered (Haig et al. 1988). The Great Lakes population is slowly recovering due to aggressive conservation efforts, and the birds have begun to reoccupy former nesting sites. By 2017, plovers had recolonized locations in all 5 Great Lakes within Wisconsin, Illinois, Michigan, Pennsylvania, New York, and Ontario (Cuthbert and Saunders 2017). Breeding distribution of the Piping Plover in Minnesota based on the Breeding Bird Atlas (2009 – 2013). Summary statistics for the Piping Plover observations by breeding status category for all blocks and priority blocks (each 5 km x 5 km) surveyed during the Minnesota Breeding Bird Atlas (2009-2013). Throughout their breeding range, Piping Plovers utilize a wide variety of open, sandy habitats, ranging from alkali lakes, wetlands, and river floodplains in the northern Great Plains, to beaches and islands along the shorelines of large inland bodies of water (Figure 2), to coastal sand dunes along the north Atlantic coast. In addition to these natural habitats, they are found in gravel mines, sand pits, industrial ponds, and dredge-spoil islands (Elliott-Smith and Haig 2004). Piping Plovers occasionally nest as single pairs in isolated locations, but it is common to find clusters of birds nesting in a semicolonial manner (Elliott-Smith and Haig 2004). It also is common to find them nesting within tern colonies, particularly those of Least Terns and Common Terns. In Minnesota’s two major breeding populations, plover nests were located within Common Tern nesting colonies. In such situations their nests are often closer to the terns’ nests than to other plovers’. Niemi and Davis (1979) speculated that the plovers may benefit from the aggressive behavior of the Common Tern. Although the terns tolerate the diminutive little Piping Plover as a neighbor, they are quite aggressive to another common, co-nesting species, the Ring-billed Gull. Such behavior may impart a degree of nest protection to the neighboring Piping Plover as well. Typical breeding habitat of the Piping Plover in Minnesota (© Google Earth; Pine and Curry Island in the foreground; in the upper right-hand corner is the tip of Sable Island in Ontario, Canada). When the Piping Plover was federally listed in 1985, biologists estimated the entire North American population numbered approximately 2,200 breeding pairs (Haig et al. 1988). The situation was particularly dire for the endangered Great Lakes population, which was estimated at just a dozen pairs (Cuthbert 2016). Given the precarious status of the Piping Plover, the U.S. Geological Survey began an International Piping Plover Census in 1991 to help assess the effectiveness of intensive management efforts, which were soon underway. Conducted every five years, the survey is conducted on the plovers’ breeding grounds and wintering grounds. The results of the breeding-ground census from 1991 through 2011 are shown in Figure 3. 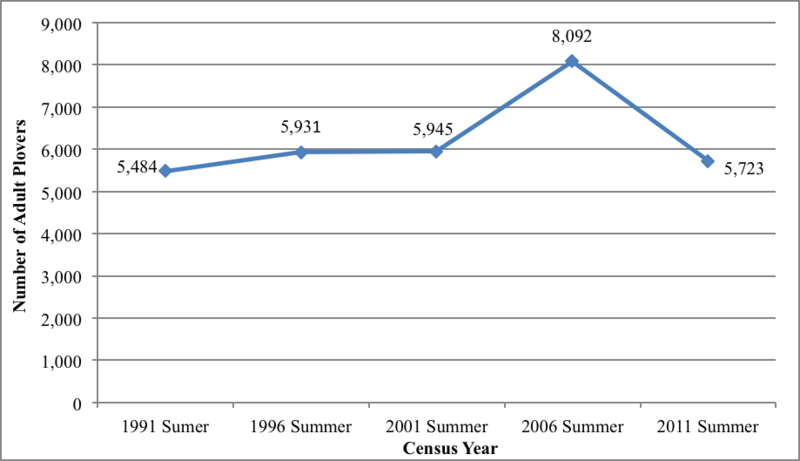 Excluding 2006, the population has averaged 5,770 breeding adults. In 2006, an unprecedented 8,092 birds were observed, with nearly twice as many adults observed in the northern Great Plains than were observed in 2011. The census compilers noted that the subsequent decrease in 2011 might be real, or it might be “an artifact of extreme flooding in the region in 2011 which rendered much traditional habitat unsuitable” (Elliott-Smith et al. 2015). Only future years will shed light on the long-term trends. The Piping Plover’s population status in Minnesota is quite tenuous; breeding pairs have been absent from the Duluth-Superior Harbor since 1985 and in recent years have only nested sporadically on Lake of the Woods. The rapid decline of the nesting population on the lake’s Pine and Curry Island is illustrated in Figure 4. Nationally, however, the species recovery has been a success story. From a low of just a dozen breeding pairs in the 1980s, the endangered Great Lakes population now numbers 112 adults (Elliott-Smith et al. 2015). The entire North American population has recovered from a low of approximately 4,440 breeding adults in the early 1980s (Haig et al. 1988) to a minimum of at least 5,770 adults and possibly much higher. The primary threats to Piping Plovers are habitat loss and human disturbance. The open, sandy habitat it depends on during both the breeding and wintering seasons is often coveted for recreational pursuits and coastline development. Even when habitat remains, recreational use of the beaches causes serious problems including dogs running off-leash, driving by cars and recreational vehicles, beach grooming, and dense concentrations of people (Cuthbert, pers. comm.). In more remote regions, such as Lake of the Woods, high water levels may be managed to balance multiple competing needs, such as hydropower generation, recreation, and flooding. When high water levels need to be maintained to address these issues, the low-lying sandy beaches where plovers are nesting may be in jeopardy. Lack of sufficient sediments to replenish eroding beach lines can also result in habitat loss. In Lake of the Woods, the sediment load of two primary tributaries along the lake’s south shoreline, the Rainy River and the Little Fork River, has notably declined in the past 40 years (Herb et al. 2004). 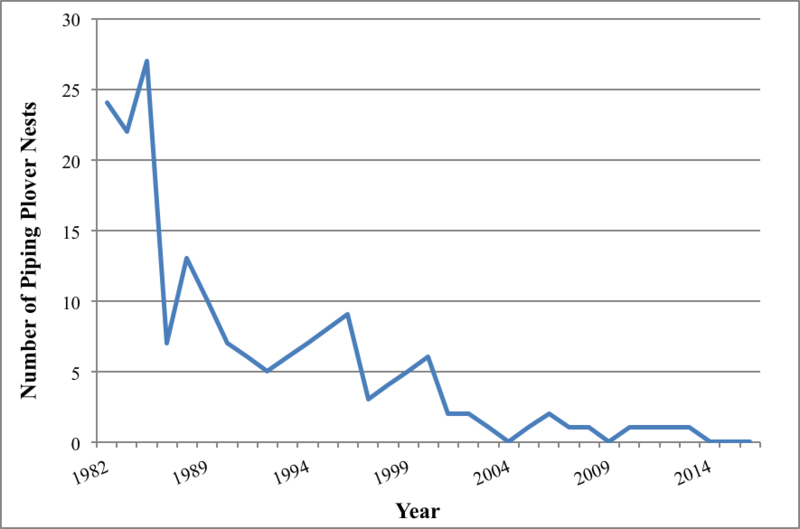 Number of Piping Plover breeding adults in North America from 1991 to 2011 (Elliott-Smith et al. 2006, 2015; Elliott-Smith and Haig 2004). Number of Piping Plover nests on Pine and Curry Island, 1982–2016 (Haws 2008; Herwig, pers.com). Federally listed in 1985 as an Endangered Species in the Great Lakes and a Threatened Species in the northern Great Plains and along the Atlantic coast, the Piping Plover is also listed by states that support breeding and wintering populations. It was designated a Highly Imperiled species by the U.S. Shorebird Conservation Plan Partnership (2016) and Partners in Flight (2017) assigned it a Continental Concern Score of 18/20. In Minnesota, it has been state-listed as an Endangered Species since 1984 (Coffin and Pfannmuller 1988) and is a Species in Greatest Conservation Need (Minnesota Department of Natural Resources 2015). The species’ recent recovery is due largely to very intensive management efforts on its breeding grounds. Conservation organizations and resource professionals cooperate to close nesting beaches during the breeding season, control avian and mammalian predators, and erect predator exclosures around active nests. When nests are at high risk, even translocation and captive rearing techniques have been implemented (Elliott-Smith and Haig 2004). Habitat protection and acquisition are important conservation tools. In Minnesota, Pine and Curry Island was acquired and designated as a state Scientific and Natural Area specifically to aid the protection and management of this once-significant population. In the Duluth-Superior Harbor, Interstate Island was acquired as a wildlife management area in the hopes that it too would provide a secure nesting site not only for Common Terns but also for Piping Plovers. The dwindling population on Pine and Curry Island has been intensively managed and monitored since the early 1980s. Efforts have included predator control, the erection of predator exclosures, and closing beaches during the nesting season. Unfortunately they have not offset the impacts of dwindling habitat. Warming temperatures pose additional threats to species like the Piping Plover that are dependent on coastal or inland shoreline habitats. Rises in sea level will threaten both breeding and wintering areas, while more intense rain events in the northern Great Plains may result in more frequent flooding of shoreline habitats. A recent assessment of the potential impacts of climate change on the Piping Plover classified the species as “climate endangered” based on models that predicted the loss of more than 60% of its coastal wintering habitat by 2080 (Langham et al. 2015; National Audubon Society 2016). In the meantime, Minnesota’s best hope for reestablishing a sustainable breeding population of Piping Plovers may lie in the success underway to recover the Great Lakes and northern Great Plains populations. If managers are able to maintain suitable breeding habitat in key locations as nearby populations recover, more birds may attempt to colonize former breeding areas where suitable habitat still exists. As noted earlier, the St. Louis River Alliance, a local conservation group in Duluth dedicated to restoring, protecting, and enhancing the St. Louis River, was awarded a five-year grant from the U.S. Fish and Wildlife Service in 2012 to help protect critical nesting beaches that might entice birds migrating through the harbor to remain and nest once again. Anderson, Bryce. 1979. “Observations from Pine/Curry Islands – Lake of the Woods.” Loon 51: 144–145. Bronoel, Joel K. 1948. “Harbor Island, St. Louis Bay, Duluth.” Flicker 20: 107. Bronoel, Joel K. 1953. “Harbor Island Census – 1953.” Flicker 25: 111. Bronoel, Joel K. 1954. “Census of Harbor Island in St. Louis Bay – 1954.” Flicker 26: 118. Bronoel, Joel K. 1955. “Census of Harbor Island in St. Louis Bay – 1955.” Flicker 27: 174. Cuthbert, Francesca J., and Sarah P. Saunders. 2017. Piping Plover Breeding Biology and Management in the Great Lakes, 2017. Report to the U.S. Fish and Wildlife Service. East Lansing, MI: U.S. Department of the Interior, Fish and Wildlife Service, East Lansing Field Office. Haig, Susan M., D. Brown, W. Harrison, Ross Lock, Lee A. Pfannmuller, Ed Pike, and Mark Ryan. 1988. Recovery Plan for the Great Lakes/Northern Great Plains Populations of the Piping Plover (Charadrius melodus). U.S. Fish and Wildlife Service Report. Hofslund, Pershing B. 1950. “Census Review, Harbor Island, Duluth, Minnesota.” Flicker 22: 128–129. Hofslund, Pershing B. 1952. “Sixth Annual Harbor Island Census.” Flicker 24: 164. Kessen, Ann E., and Peder H. Svingen. 2007. “The Summer Season, 1 June through 31 July 2006.” Loon 79: 15–44. Lakela, Olga. 1940. “The Status of Piping Plovers (Charadrius melodus) Minnesota Point.” Flicker 12: 34. Lakela, Olga. 1946. “Additional Observations on the Nesting of Piping Plovers in Duluth.” Flicker 18: 11. Longley, William H., and Byron E. Harrell. 1946. “Minnesota Nesting Records, 1946.” Flicker 18: 79–84. Niemi, Gerald J., and Thomas E. Davis. 1979. “Notes on the Nesting Ecology of the Piping Plover.” Loon 51: 74–79. Reif, Charles B. 1941. “Minnesota Nesting Record, 1941.” Flicker 13: 27–31. Risser, Alden. 1932. “The 1932 Nesting Season.” Flicker 4: 19–32. Schimpf, Ann, and Lee A. Pfannmuller. 1984. “Will the Piping Plover Survive?” Minnesota Volunteer 47(May/June): 50–55. Wiens, Terry P. 1986. “Nest Site Tenacity and Mate Retention in the Piping Plover (Charadrius melodus).” MS thesis, University of Minnesota. Wiens, Terry P., and Francesca J. Cuthbert. 1984. “Status and Reproductive Success of the Piping Plover in Lake of the Woods.” Loon 56: 106–109.